Designed with the growing family in mind, the ALL-STAR will look great in your driveway! Originally patterned after our flagship model, the MVP, the ALL-STAR is slightly smaller in size, but don’t let size fool you. The standard 36" x 54" Competition Tempered GLASS backboard, 5" square structural steel pole and 3’ extension give the ALL-STAR all the features needed to develop Rising Stars! Customize your All-Star by choosing an Internal or External Height Adjustment Mechanism. 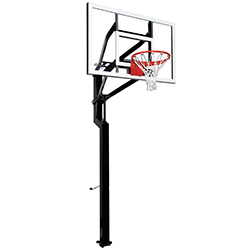 (Adjustable from 6’ – 10’) You can also further customize your ALL-AMERICAN System with a 3/8" Competition Tempered Glass or Fortified Acrylic Backboard.